Welcome to North Georgia Zoo & Farm located 90 minutes north of Atlanta. Come and experience a wonderful time with your family, as this general admission ticket gives you access to the petting zoo too! 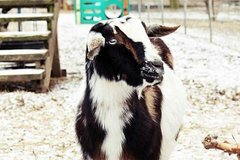 While you are here you will get to visit, feed and interact with hundreds of miniature and rare breed farm animals. Get up close and see animals like such as giant tortoise, alligator, zebra, camels and many more! Seasonal schedule and times apply. Some animals change out seasonally or are not available during certain seasons - we apologize in advance. • Shows, Encounters, Demonstrations: Creature Features, Babies and Bottles, Kiddie Corral and others. • Zoo Tour: A 45 min-1 hour guided tour to learn more about and get to see wild animals such as deer, kangaroos, lemurs, Fennec fox, snakes, alligators and more. There is a small presentation at the end, with some of our smaller exotic animals and then enjoy the petting and feeding area of the zoo at your leisure.